Stocks in the U.K. were clinging to thin gains Tuesday, as concerns about British economic growth capped a stronger rise for the benchmark FTSE 100. 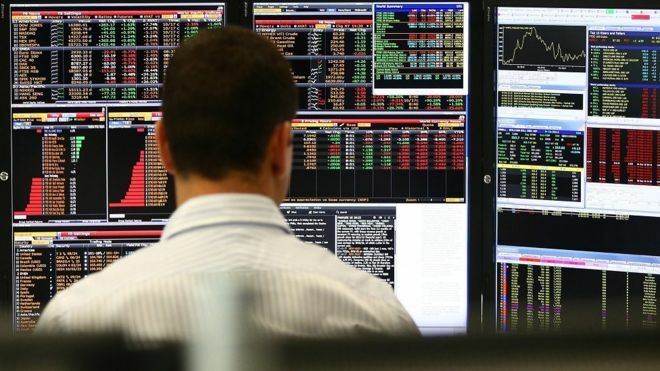 The FTSE 100 UKX, +0.08% edged up 0.1% to 7,356.19, led by the basic materials and consumer goods groups, while utility and industrial shares were in the red. On Monday, the index fell 0.3% . Last week, it hit its highest closing level on record at 7,382.90. The index on Tuesday briefly rose as much as 0.2% as the pound slid to its lowest since mid-January. A weaker pound in recent months has lifted large-cap shares on the prospect that the currency’s lower value will boost earnings and revenue made overseas by multinational companies. The pound GBPUSD, -0.4004% hit an intraday low of $1.2183, down from $1.2231 late Monday in New York, following separate data showing slower-than-anticipated growth in British housing prices and a decline in retail sales. The House of Lords on Tuesday is expected to back an amendment to the Article 50 Brexit bill that would have both houses of parliament vote on terms of a deal for Britain to exit the European Union. “For the FTSE 100 to be flat against a falling pound and some solid gains for commodity stocks plays towards the idea that the equity market rally is running out of steam,” said Cross, noting that U.S. stock futures sagged before Wall Street’s open. The lackluster move on the FTSE 100 comes before the British government’s outline of the budget on Wednesday. Miners: A few metals producers were perched near the top of the FTSE 100, with Rio Tinto PLC RIO, +1.36% RIO, -2.66% RIO, -0.84% up 1.4% and BHP Billiton PLCBLT, +0.82% BHP, -1.84% BHP, -0.97% higher by 0.9%. J.P. Morgan’s commodities research team upgraded price forecasts for various base and precious metals. J.P. Morgan Cazenove upgraded commodities producer Glencore PLC GLEN, -0.43% to neutral from underweight, but its shares eventually swung lower and lost 0.2%. Other movers: Intertek Group PLC ITRK, +4.15% shares leapt 4.3% as the inspection, and product testing company swung to 2016 pretax profit, aided by a weaker British pound. On the downside, Ashtead Group PLC AHT, -2.47% fell 3.3% after the equipment-rental company said fiscal 2017 results were expected to be in line with management expectations. But that compares with its previous forecast for full-year results to be ahead of expectations. Worldpay Group PLC WPG, -2.11% slumped 2.7% as the payments processor said its medium term guidance, which includes targeting compound annual net revenue growth of between 9% to 11%, remains unchanged. Worldpay did swing to a profit for 2016. Economic data: U.K. retail sales fell in February, the British Retail Consortium said Tuesday, at a time when inflation has been accelerating. Like-for-like sales fell 0.4% on the year in the four-week period from Jan. 29 to Feb. 25. U.K. house prices rose by 0.1% in February from January, according to lender Halifax. Analysts polled by The Wall Street Journal expected prices to have risen by 0.2% on the month.